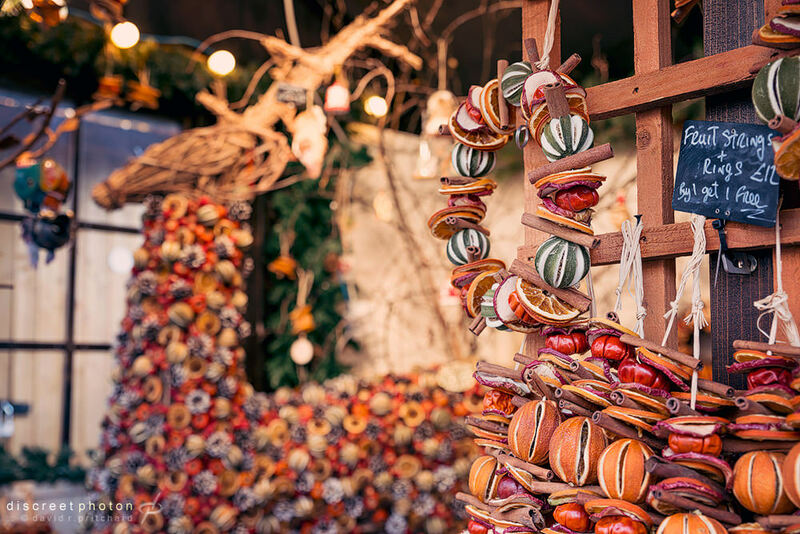 Christmas markets are starting to pop up across the country and they're a great photographic opportunity. Festive markets are bursting with Christmas colours so make sure you take advantage of this. Late afternoon or early evening are the best times to visit as the dark sky against the festive lights create a magical atmosphere. Christmas wares on colourful displays look great so take the time to stand back and use a small aperture to get a stall's full collection of produce in. You may have to wait until almost closing time if you don't want people in your shot but shoppers, particularly if they're interacting with stall holders, can add to your picture. Just remember to be polite, ask if it's OK to photograph them and their stall and don't get in the way – it's a business after all so if they ask you to move on politely do so. If there's room to get close to the gifts on offer look out for baubles and other decorations dangling from the stalls. They can make great macro shots, particularly if they're glittering against a background you've thrown deliberately out of focus. Adding a little flash can help quicken the shutter speed which can be a big help when working in low light. As your market will probably be outdoors, watch your exposure as it can alter drastically between the walkways and under the stalls which can cause your shots to be underexposed. Keep an eye on your white balance too as street lights can look rather orange. You'll probably find it's best to bracket most of your shots, taking a shot above and bellow the correct exposure. Try standing back and shooting enough shots to stitch together as a panorama to show people the whole scene. There's no doubt that the market will be bustling so there will be ample chance to capture some shots of people wrapped up in their winter gear, carrying plenty of shopping bags filled with Christmas gifts. Try using a slower shutter speed to blur their movement as they walk through your frame. If any lights are swaying or there are fairground rides these will also work well blurred into colourful lines of light.